M8G Recovery, Release, Proclaim, Because Jesus is our Jubilee | GOD Who Are You? AND Who Am I? Jesus’ words of “recovery of sight for the blind” is not only a spiritual and emotional healing, but also refers to physical healing. When the opportunity arose to give a testimony at a women’s gathering, Sandy sensed the Lord wanted her to do so. Out of obedience, she volunteered. The next day, Sandy’s husband was in Kansas City on his truck driving route delivering mail, when she suddenly got a splitting headache. Sandy knew she was gravely ill and decided to drive herself from her country home to the hospital, over twenty miles away. Her husband encouraged her on the other end of the cell phone, helping her to find her way. She was immediately air lifted to Kansas University Medical Center since her husband was already in that vicinity. A CAT scan revealed five aneurysms in her brain. Surgery repaired one that was leaking on the left side of her head. Further surgeries were planned. People from all over Kansas, and from Ohio to New Mexico prayed for Sandy, holding the blood of the Lamb over her, claiming that by His stripes she was healed. They knew that just as the children of Israel were delivered that night long ago, Sandy would also be delivered by the blood of Jesus. Within weeks, Sandy was back to work full-time, and able to keep her planned testimony talk. And talk she did, rejoicing in the work of the Lord. Every participant was convinced, “this happened so that the work of God might be displayed in [her] life” (John 9:3). “Two hours to see the doctor, and that’s all there was to the appointments,” Sandy said. A test was to be done two months later, but her doctors decided not to do it because she was doing so well; as of four years later, no further surgeries were ever performed. “Did you know Jesus was a Jew?” Kim asked. “The first five books of the Bible, your Pentateuch, are our laws as Christians,” she explained. Kim walked with girls in the office. They pumped her with questions. She was lied to so much by her mother that she would not tolerate lies coming from anyone else’s mouth when it came to her Savior or the Bible. After the deliverance retreat where Kim renounced the stronghold of the occult on her life, she found it had not only been completely removed by the cross of Jesus Christ and His shed blood for her, but also for her family. Her mom, dad and Hank quit reading their horoscopes, biographies and auto-biographies of physics, spiritualists and all that garbage. They also had no interest in the occult whatsoever after that retreat. All my family and I, including some cousins, were going to a restaurant down a flight of stairs in a little scoop inside some hills. We walked a long way to the bottom. I was leading the way, pushing my mother in a wheelchair. We went into the restaurant, ordered, and when we finished eating, we looked out and saw that the hills all around us were on fire. We could not see a way out, but I kept looking and finally saw a pathway that was not on fire. I told mother, “Come on, I’ll get you out.” We simply walked out, and the rest of the family followed. The other customers did not. The following year, Kim joined her mother, her sister Hank, her grandparents, and her favorite aunt. Doctors were unable to give her that promised liver transplant because she contracted breast cancer and the liver treatments would have made her vulnerable to the cancer’s return. 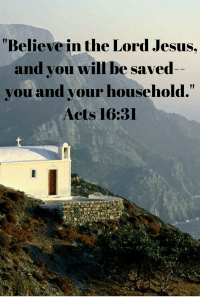 Kim’s father and other relatives she saw following her were left behind, but she knew she would see them again—when all the oppressed would be released, her whole household saved (see Acts 16:31). “The spirit of the Lord is upon me . . . to proclaim the year of the Lord’s favor” (Luke 4:18). This statement Jesus made summarizes every word he had just revealed about Himself from the book of Isaiah. He was saying that in Him, all our debts (spiritual and physical) are cancelled, all slaves (spiritual and physical) are free, all lands are restored, all families are reunited, every day of every year. The Year of the Lord’s Favor is the Year of Jubilee as described in Leviticus, Chapter 25. On the Day of Atonement (Yom Kippur), the most solemn holy day of the Jewish people, the sins of the nation were confessed. This was the only day of the year the priest was permitted to enter the Holy of Holies when he presented an offering for the “covering” of the peoples’ sin, and those sins were laid on the scapegoat that was banished outside the camp. When Jesus (our scapegoat) died on the cross, the veil that separated the people from God in the Tabernacle split down the middle. Thus, sin was no longer covered, but washed away by Jesus’ blood so we can run into God’s presence through Jesus Christ every moment of every day. Better still, He lives within our hearts. Also, on this solemn Day of Atonement, on the tenth day of the seventh month every fiftieth year [September on our calendar], a trumpet blast announced the Year of Jubilee. Every seven years (the Sabbath Year) the land was to remain fallow; the whole year was to be dedicated to seeking the Lord; and He would provide for their food every six years, making their crops produce enough to feed them for three years. The Year of Jubilee arrived every seven times seven years, announced in the forty-ninth year, which meant that two years in a row there would be no tilling of the ground or work of their own hands. Those years were to be given to the Lord as they sought to learn of Him trusting Him to meet their needs. Beginning on the Day of Atonement, all financial debts were cancelled; slaves of Israelite origin were set free. Any sale of land amounted to a lease that expired in the Year of Jubilee, when it would be returned to the original family (of the twelve tribes). God told them, “The land must not be sold permanently, because the land is mine and you are but aliens and my tenants” (Lev. 25:23). “Consecrate the fiftieth year and proclaim liberty throughout the land to all its inhabitants. It shall be a jubilee for you; each one of you is to return to his family property and each to his own clan” (Lev. 25:10). The Bible does not say, but possibly, the proclamation Jesus made in the synagogue was on this solemn Day of Atonement. Jesus tells all those who have ears to hear and hearts to understand, that He alone is our Jubilee—in every area of our lives—every minute of every day. He alone is our Healer; He alone is Jehovah-Rapha. Even Webster’s dictionary defines “kingdom come,” from the Lord’s Prayer as “the next world; heaven.” We can live in heaven’s freedom and liberty right now when we come before Jesus with exposed hearts, seeking forgiveness as we forgive, and face where we came from. May “[His] kingdom come, [His] will be done on earth as it is in heaven” (Matt. 6:10).